Two vicious bursts from Sohail Tanvir and Thilan Samaraweera's hitherto-unsuspected shot repertoire saw Kandurata Warriors comfortably beat Uthura Rudras. The victory is the first for the Warriors in the Sri Lanka Premier League, leaving the Rudras the only winless side after three matches. In pursuit of 169, the Rudras' chances were dented by Tanvir's first two overs, which yielded two wickets for nine. When John Hastings claimed two of his own soon after, the Rudras' most dangerous batsmen were already back in the dug-out, and they were faced with a required rate of well above nine, from 34 for 4. Earlier in the evening Samaraweera had blasted 71, to send the Warriors on their way to an imposing total, hitting nine fours and a six in his 45-ball stay. Tanvir was close to unplayable in his first two overs, as he swung the ball prodigiously away from the right-hand batsmen, and got plenty to jag back off the seam as well. Rob Quiney knew no more about the indipper that sent him back second ball, than Mahela Udawatte knew about the one that uprooted his off stump in Tanvir's next over. Brendan Taylor and Chamara Kapugedara were quickly removed by Hastings, and when Jehan Mubarak fell to Saeed Ajmal for 13, the Rudras had lost their top five for 54. Dillon du Preez launched three boundaries to spark hope of an unlikely recovery, but when the rains came down at 105 for 7 from 16 overs, the Rudras' fate was sealed. 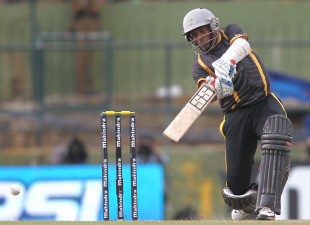 Sanath Jayasuriya earlier took guard at the top of the innings for the first time in the SLPL, but it was partner Samaraweera who was the unlikely source of early momentum for the Warriors. Four boundaries in seven balls began Samaraweera's assault and signaled he wasn't just there to play second fiddle to Jayasuriya. Having made mere spectators out of several opening partners during his international career, Jayasuriya watched on this time, as the once obdurate Samaraweera showcased a startling array of strokes, including two over-the-shoulder-scoops off Naved-ul-Hasan. At Jayasuriya's demise at 50 for 1, he had only made five runs, and Samaraweera's 27-ball 50 proved the catalyst for a dominating Warriors performance.